May recommendation is to protect families! Now is the time to help our neighbours and friends understand the consequences of a Yes vote. This campaign will now be decided by which side is prepared to work the hardest to ‘Get Out the Vote’. As of Friday, 6 October 2017, the ABS estimated it has received 10.0 million (62.5 per cent) survey forms. With 1 in 3 ballot papers yet to be sent back, we need to make every one of the last 22 days count and ensure that we influence the remaining 37.5 per cent, or 6 million eligible Australians, to vote ‘No’ in order to maintain man+woman marriage in this country. * Make sure you post your vote back immediately. * Eligible Australians have until 6pm (local time) on Friday, 20 October 2017 to order a replacement survey form if it never arrived, has been lost or damaged. To order another form, phone 1800 572 113 or order online here. WATCH what 'Safe' Schools exposes your children to without your consent. 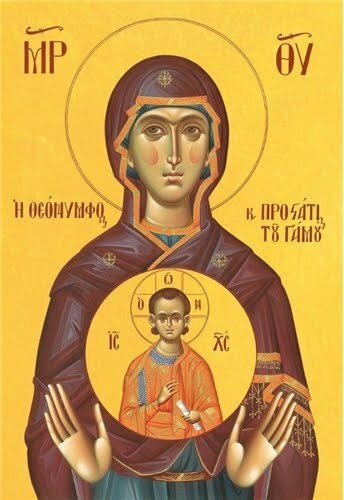 The icon of the "Theotokos, Bride of God & Protectress of Marriage is now available. Пажљиво погледајте филм о тзв. "сексуалном образовању" иза кога, у целом свету, стоје мрзитељи човечанства. После овога ће вам бити јасно куда нас воде светске вође. Погледајте и овај линк па ћете видети да и наши суграђени Аустралијанци брину о будућности своје деце. Молим Вас да са овим упознате и своје млађе. Changing the legal definition of marriage would have profound consequences for our society. All Australians deserve to have their say about its future. In 2016 the Coalition Government was re-elected after promising to hold a plebiscite to settle Australia’s long-running marriage debate. Your petitioners ask that the Senate respects the will of the Australia people and passes enabling legislation for a plebiscite on marriage to be held.